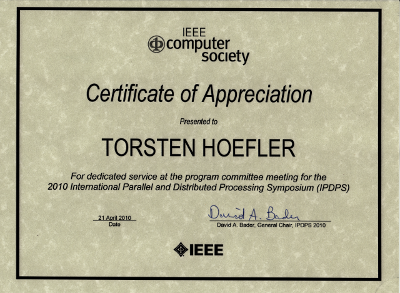 I guess I have to mention the craziest PC meeting I attended so far: IPDPS’10. Cindy Phillips, the PC chair scheduled the meeting for Friday 12/6/09 in Albuquerque (a while ago). We met at 6:30am at the hotel (I flew in late the day before and didn’t get too much sleep … which wasn’t really too good. The meeting had only minimal breaks scheduled (10 mins breakfast, 30 mins lunch, etc.) and we started out very slow with the good papers (and spent way too much time on clear accepts – as usual ). Well, the conference also received a record-submission of more than 500 papers … my track (Software) was the heaviest. The meeting was very professionally managed by Cindy, good job! However, the number of submissions was just overwhelming. If we assume a 9 hour meeting, we would have about 1 minute per paper which seems very unrealistic. We spent on average more than three minutes and sometimes much longer. Well, it was evening by the time we were down to the complicated “middle-field”. All in all, the meeting took longer than 17 hours and was extremely exhausting. I think we made good decisions and selected a good program. It should have been a two-day meeting though .